The Natural Form Health Series delivers the ultimate therapeutic sleep experience with its patented self-adjusting technology and non-toxic materials. Try Natural Form in your home for 100 nights. If you don’t absolutely love it, we’ll pick it up and provide a full refund – no questions asked. Our mattresses ship for free to the lower 48 states. Optional White Glove Delivery is available as well. 0% mattress financing with Synchrony. 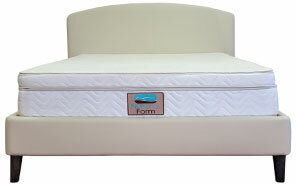 Sleep soundly with Natural Form’s interest-free financing! Start enjoying the benefits of a healthy nights sleep. Wake up feeling healthy, relaxed, refreshed and rejuvenated…sleep better than ever before. Hypoallergenic Soft Merino Australian Wool helps regulate your body temperature keeping you cool. Firmer or Softer, you both get to choose. Adjust to your ideal level of firmness. Independent helix shaped air pods automatically conform to your individual body weight, shape and size. The helix shape allows the air pods to reform like a spring, supporting your body without the painful pressure caused by spring beds. The air pods adjust to your movements almost instantly, creating a surface that supports and pressure relieves simultaneously. Every inch of your body will be continuously comforted and supported throughout the night, giving you uninterrupted sleep. Tutorial of the Self Adjusting Technology in the Natural Form Air Pod Mattress System. Our Helix Air Pod Technology continually adapts to support your body using up to 80 patented self-adjusting pressure relief air pods. Each dial allows you to select and fine tune your ideal firmness for your individual comfort and support on your side of the bed. The Natural Form Health Series + cuts the cord on old powered air bed technology. No noise. No motors. No pumps and no electricity required to operate. This quick recovery breathable CertiPUR-US memory foam offers all the benefits of traditional memory foam but has superior durability, comfort and ease of movement. Your new Natural Form® mattress comes with a machine washable and removable wool cover. It is no secret that the scenes of Vermont and it’s pure mountain air are refreshing and uplifting. Our mattress benefits parallel the idyllic Vermont, providing you with a remedying sleep that is restorative and tranquil. The Natural Form mattresses are designed to aid acute sleeping conditions and provide a soothing sleep, so that every morning wake-up is like a breath of fresh air. Every Natural Form product embodies Vermont’s values and lifestyle. To live fully, healthfully, and naturally is the goal of every product we design and produce. Designed by Vermonters and made in Vermont, our passion for creating quality products that improve the health and well-being of others is woven throughout the company. All of our mattresses are designed and handcrafted at the base of the Green Mountains in Southern Vermont.